Spring Festival,the traditional Chinese New Year's Day,is China's most important national holiday. The date of the new year is still determined bythe lunar calendar even though the government of the Republic of China adopted the international Gregorian calendar in 1912. New Year's Day typically occurs sometime in early spring (February). 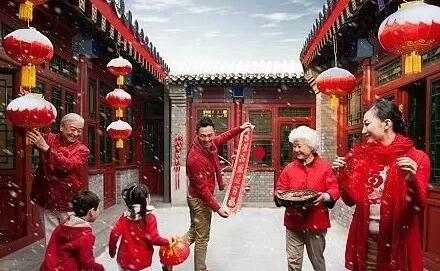 The Spring Festival like Christmas Day in the western countries, is the most important festival in China. Children like it very much because they can have delicious things to eat, pretty clothes to wear and many nice things to play with. When Spring Festival comes，people away from their hometowns usually come back and spend it with their families. People mainly do two things during the festival. One is eating ,and the other is playing. They usually buy different kinds of food and make different kinds of delicious dishes, and play in different ways. Early on the first morning of the Spring Festival，families set out to pay a lunar New Year visit to each other after the members of each family greet each other with lunar New Year wishes. This is called in Chinese Bainian， meaning paying the Spring Festival visits and greetings. Usually,the youngpay a visit to the old while the people about the same age share equal greetings；then,visits are paid in sequence to relatives of close kinship,relations ,neighbors, teachers, friends and colleagues. To kowtow used to be one of the rites involved in paying the spring Festival visits,but now it is replaced by the Spring festival greetings with best wishes,for instance,wishes for a good fortune. When the junior pay the senior the Spring Festival visit, the latter are supposed to give the former some money as a gift,which is known" money for an added age. " Giving hongbao (red packets or red envelopes) during the Chinese New Year is another famous tradition. Red packets are every child's dream during the Chinese New Year. A red packet is simply a red envelope with money inside to symbolize luck and wealth. Red packets are symbolically handed out to younger generations by parents, grandparents, relatives, close neighbors and friends. The practice represents a desire for good fortune and wealth in the coming year.